Major Mitchell's cockatoos are beautiful salmon-pink, medium-sized cockatoos, who are smart and social. These birds bond strongly with their keepers and have a reputation for being one-person birds. Because they require so much attention, they are recommended for experienced bird owners who are familiar with keeping large parrots. Major Mitchell's cockatoo is native to Australia, where it makes its home in the arid inland. These birds nest in pairs in woodlands and treeless areas, always near water. They can become nomadic during dry periods. They do not like to nest near other pairs, so each requires a large swath of territory. They do, however, often hang around galah cockatoos, another Australia native. Quite a bit of their native habitat has been subjected to human development, so the wild population of Major Mitchell's is dwindling, while the more adaptive galahs are thriving. According to the 1865 "Handbook to the Birds of Australia" by John Gould, this cockatoo is named for Major Sir Thomas Mitchell, who was an admirer. He wrote of the bird, "Few birds more enliven the monotonous hues of the Australian forest than this beautiful species." This bird is the only member of the subgenus Lophocroa. 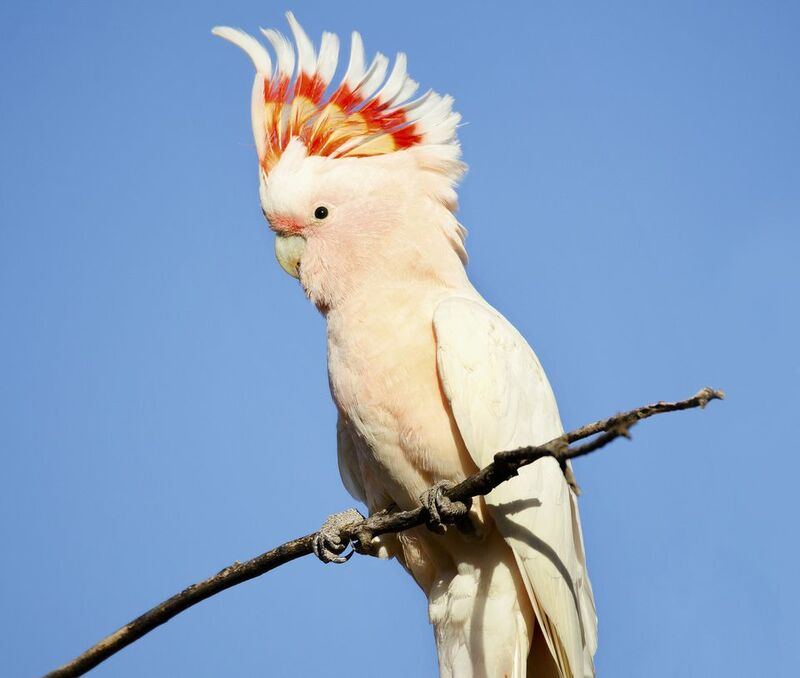 It's also the only cockatoo to have a multi-colored crest. This rather stocky cockatoo typically grows to between 13 and 15 inches in length from the beak to the tip of the tail feathers. On average, Major Mitchell's cockatoos have a lifespan of 40 to 60 years. They can live up to 75 years in captivity when treated well, especially if they're hand-fed as babies. As an example, Cookie was a longtime resident of the Brookfield Zoo near Chicago, Illinois. Possibly the most famous Major Mitchell's cockatoo, he was at least 83 years old when he died in 2016. In 2014, he was named the "Oldest Parrot - Living" by the Guinness World Records. Major Mitchell's cockatoos require a lot of socialization and interaction with owners for their emotional health. This is due to their natural tendency of forming a tightly-knit pair and you will be replicating the "flock" experience the cockatoo requires in the wild. Since they do tend to bond with one person, Major Mitchell's cockatoos can show signs of jealousy when their owners interact with other people. They may try to nip or bite the other person to show their irritation. This is one of the reasons why this bird is not a good pet for families with small children. These birds are extremely intelligent and can be taught tricks. Some do learn to speak, or can at least whistle to get their owner's attention. They can hit some pretty high notes and have a natural alarm call that will get anyone's attention. The colorful Major Mitchell's Cockatoo is primarily a pinkish-white and very easy to recognize. These flashy birds have broad pink patches around the neck and on the underbelly. They often have bold pink under their white-tipped wings. The crest is often the first thing people notice about this bird. When extended, you'll see bright pink and yellow-orange feathers with white at the tips. The males tend to be brighter than the females, though the females have more orange in their crest. While the males have brown eyes, they're more of a reddish-pink color on females. Both sexes have gray feet and horn-colored beaks. While it can be tempting to rush out and buy one of these beautiful birds, Major Mitchell's cockatoos need specialized care and environments that not all bird owners can accommodate. It's best if they live in a walk-in cage that is at least 14-foot in length. This allows the medium-sized bird plenty of room to move. In addition to needing a large cage, Major Mitchell's cockatoos are loud vocalizers. They probably aren't suited to live in apartments or other close quarters. These are high-maintenance, sensitive birds, so if you're planning to take one as a pet, prepare to spend a lot of time interacting with them. Cockatoos and other birds in captivity that are neglected may resort to destructive behaviors. Some Major Mitchell's owners have reported that they were even shunned by their bird after taking a short vacation. They also admit that it took time to earn the bird's trust again, so keep in mind that this can be a very temperamental species. Like all cockatoos, Major Mitchell's may struggle with weight gain. It is important that owners monitor their fat intake. High-quality pellets, a moderate amount of seed mix, and daily helpings of fresh, bird-safe fruits and vegetables that have been thoroughly washed are the ideal diet for these birds. They tend to enjoy green leafy vegetables like lettuce, spinach, and Swiss chard as well as carrots, celery, corn, green beans, and zucchini. Many also enjoy nuts, including hazelnuts, peanuts, pecans, and walnuts. Just like its fellow members of the parrot family, Major Mitchell's cockatoos are active birds that need plenty of exercise to maintain their physical condition. They need a minimum of three to four hours outside of the cage every day to stretch their wings. A smart owner will provide a Major Mitchell's cockatoo with safe chew toys to exercise their beaks on. These birds chew wood to make nests in the wild and will display that same behavior in captivity if they get bored or restless. It's a good idea to regularly give your bird untreated elder, fir, pine, or willow wood pieces or toys. Leather toys and even heat-sterilized pine cones are favorites for these birds as well. Also, keep in mind that these cockatoos really like water, so a watering bowl to bathe in and a mister will be very well appreciated by your pet.